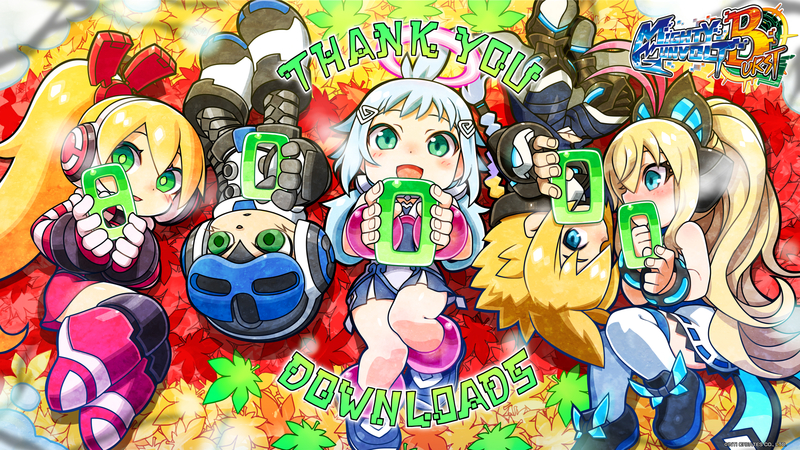 A fun wallpaper released by Inti as a “thank you” for the game being downloaded 80,000 times. Mighty Gunvolt Burst was preceded by Mighty Gunvolt, a small-scale and similarly NES-inspired title released as a spinoff to Azure Striker Gunvolt that incorporated characters from Mighty No. 9 and Gal*Gun Double Peace alongside Gunvolt himself. It was well-received, but rather light on content; it felt more like a proof of concept than anything else, although it was fun while it lasted. Mighty Gunvolt Burst, meanwhile, is a considerably more fleshed-out exploration of a similar idea: reimagining a different game (in this case Mighty No. 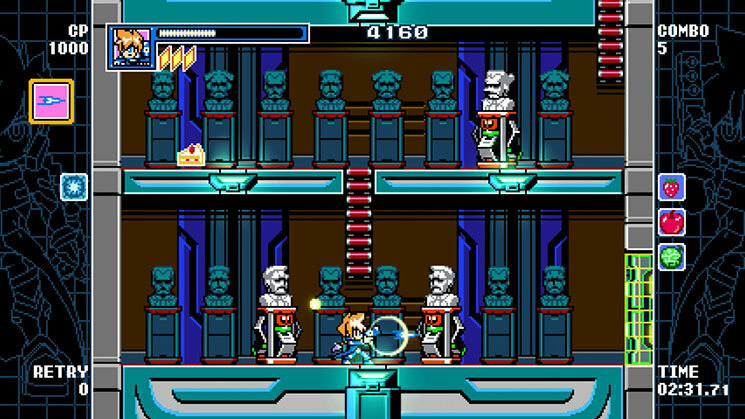 9 rather than Azure Striker Gunvolt) with NES-style visuals, sound and level design. Once again, the game sees several disparate Inti Creates narrative universes colliding with one another; much as in the original Mighty Gunvolt, you can play as Mighty No. 9 protagonist Beck and Azure Striker Gunvolt’s eponymous hero — as well as Ekoro from Gal*Gun Double Peace if you beat the demo version and transfer its save data to the full game. 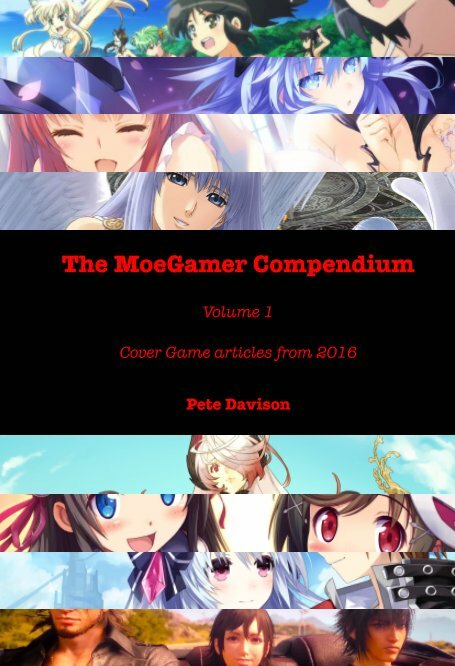 But the game has also been expanded further from its originally released form with the addition of a substantial roster of DLC characters, including Gal*Gun Double Peace antagonist Kurona, Beck’s counterpart Call, Gunvolt’s guardian angel and muse Joule/Lumen, Mighty No. 9 DLC star RAY, and Gunvolt’s rival Copen. Each of these characters has their own unique mechanics and twists on how the game is played, and it’s possible to do a full runthrough with each — though only Beck and Gunvolt’s routes feature any mid-game dialogue and narrative sequences beyond an intro and ending. Not that this is a game where the narrative particularly matters. “Mighty Gunvolt was originally created as a fun little bonus title that was released to Mighty No. 9 backers and of course on the Nintendo eShop,” Inti Creates producer Matt Papa tells me. “For Burst, that came from the team’s strong love for the Mighty No. 9 cast of characters, and wanting to do something really fun with them that is 100% Inti Creates style: 2D side-scrolling sprite-based action! Ikegami’s enthusiasm to work on the project is just one of many examples of Inti Creates’ employees voluntarily going far beyond the call of duty due to their passion for their work; evidently this sort of behaviour has become an important part of the company’s overall culture, with other instances including Papa’s own attempts to deliver “what the fans deserved and wanted” with regard to Azure Striker Gunvolt’s English version through its substantial “re-localisation” project. Playing the game, it’s clear that everyone who worked on it had great fun doing so. The art is authentically “late-era NES” in style and thus deliberately limited in both colour palette and resolution, but within these constraints the sprites are detailed and display a ton of personality, capturing the various characters’ essences perfectly. The music provides catchy chiptune renditions of several Mighty No. 9 and Azure Striker Gunvolt tracks — in the former’s case actually managing to sound superior to that game’s optional “retro” soundtrack option. 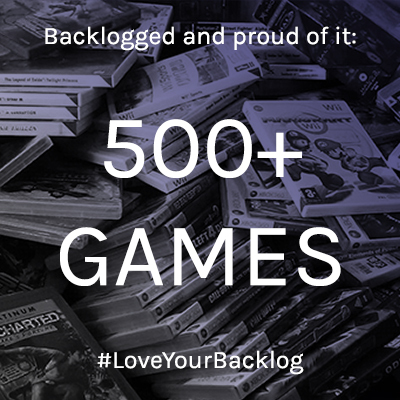 And the gameplay is absolutely delightful, blending old-school difficulty with modern conveniences such as unlimited continues and regular checkpoints to create something that is simultaneously accessible and challenging. Echoing Mighty No. 9‘s level structure, Mighty Gunvolt Burst opens with you proceeding through a single introductory level before being provided with a wide selection of stages you can tackle in any order. Once all these stages have been cleared, a series of final challenges unlocks, and once you’ve beaten all these, you’ve cleared the game. Kind of, anyway; there’s a substantial metagame to Mighty Gunvolt Burst that involves playing each level several times to acquire different reward items each time, tracking down hidden objects in each stage, and attaining S-ranks on each stage by scoring enough points. This overall metagame subsequently ties in to a number of other elements in the game, most notably its progression system. Eschewing both Gunvolt’s RPG-style levelling, crafting and equipment system, and Mighty No. 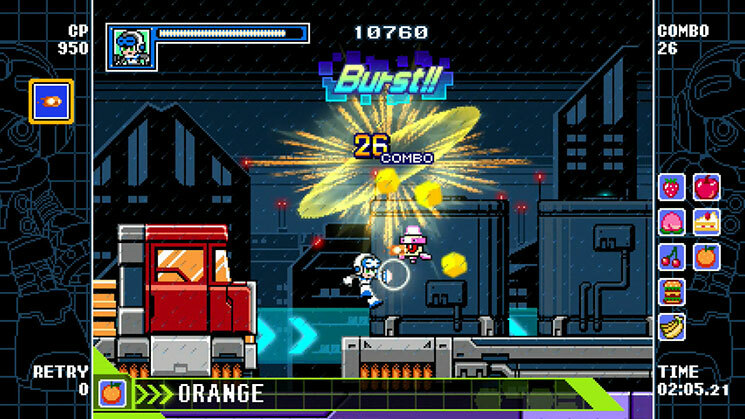 9’s Mega Man-esque absorption of boss abilities, Mighty Gunvolt Burst features an impressive “customisation” option which gradually expands as you progress through the game and collect various items. The exact implementation of the customisation system varies according to which playable character you’ve chosen, but in most cases, you ultimately have the power to change shot speed, shot size, firing arc, what element your shots are infused with, whether or not you fire a spread shot, whether bullets explode when they hit something, whether you can fire through walls, how many bullets you can have on screen at once, how much damage you take and even whether or not your character is able to use their unique special ability. 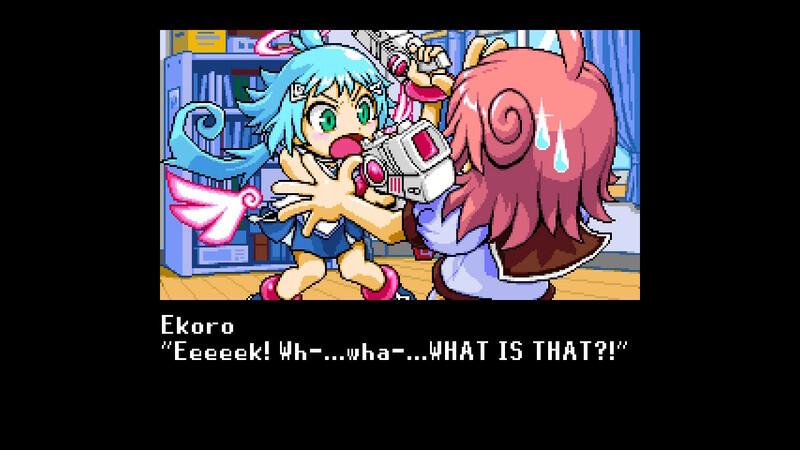 Different characters also have their own unique options; Beck can be set to fire different types of bullets, for example — a primarily aesthetic choice in this case — while Ekoro can unlock the ability to fly for short periods. 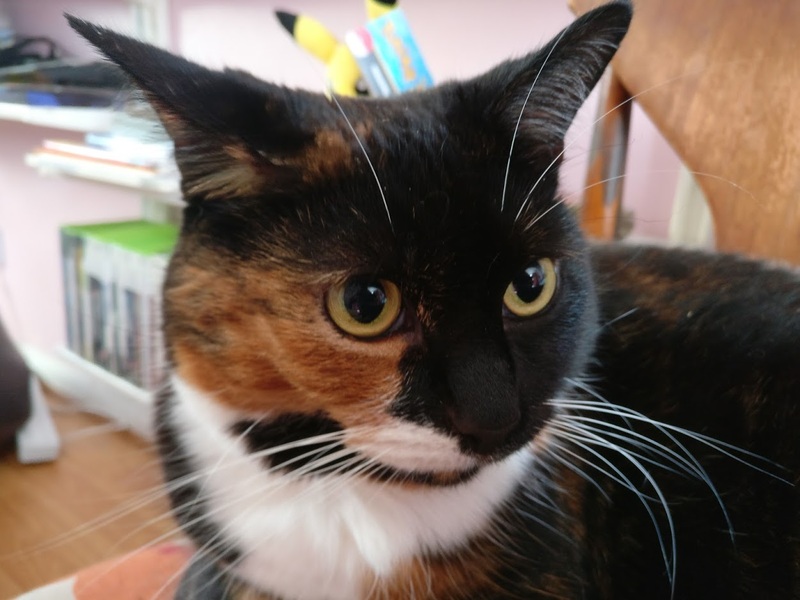 She is an angel, after all. While the obvious strategy would seem to be to activate everything possible at any given juncture, there are two additional considerations to bear in mind: firstly, the maximum combination of abilities you equip or activate is determined by a stat called “CP” that you build up by collecting gems throughout the levels. More powerful or tactically advantageous abilities cost more CP, so you’ll often have to weigh up which things you really need to pass the upcoming level — that or go and grind until you have enough to turn everything on. Secondly, the more CP worth of abilities you have activated when you clear a level, the lower your score will be. In other words, if you make the game as easy as possible for yourself — which you’ll probably want to do while you’re clearing the levels for the first time and getting to know them — you’ll never get the best possible ranks. Consequently, buffing yourself up to godlike potential will never allow you to achieve 100% completion on the game, which requires an S-rank on all stages; to achieve that you’ll need to deliberately gimp yourself somewhat. There’s no obligation to go for S-ranks, however, and indeed a great deal of enjoyment (and challenge) can be derived from just trying to make it through the game, which is difficult enough at times even with high-level abilities. 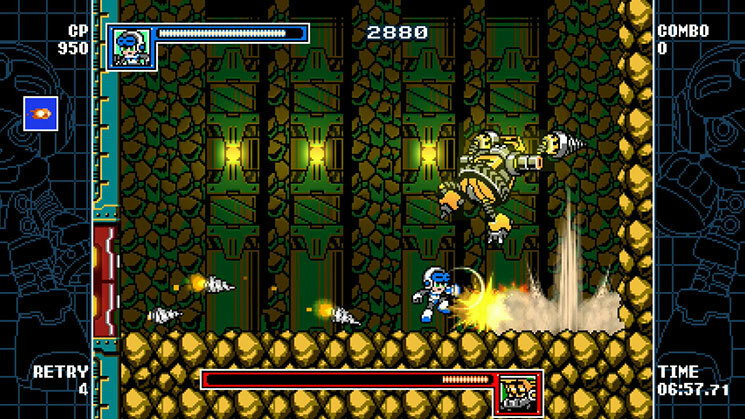 But for those who grew up with Mega Man and truly want to prove their skills, you’ll have to take the training wheels off at some point — as well as get through the stages as quickly as possible, with as many collectible items as possible, chaining as many “Burst” (close-range) attacks as possible… all without dying. The different characters each play markedly differently from one another in a number of ways. 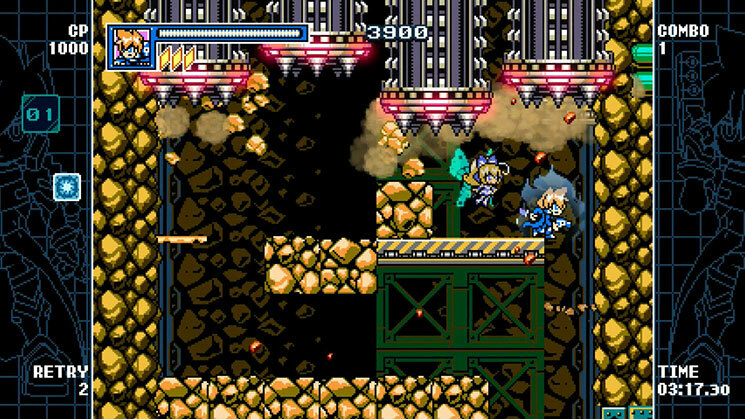 For example, while the Gunvolt here lacks his iconic “Flash Field” ability from his original game, he still has access to some of his skills. Meanwhile, Ekoro has a significantly shorter life bar, but is able to jump much higher and is able to charge up an ability that not only makes her temporarily invincible, it also lets her score Burst attacks from range. Elsewhere, Kurona is speedy, Lumen can use her songs to break through the CP limit on equippable abilities, Call can use her barrier abilities and Patch robots… you get the idea. While the stage layouts and bosses themselves don’t change, each character handles differently enough to make a playthrough with each eminently worthwhile, whether or not you go for 100% completion. 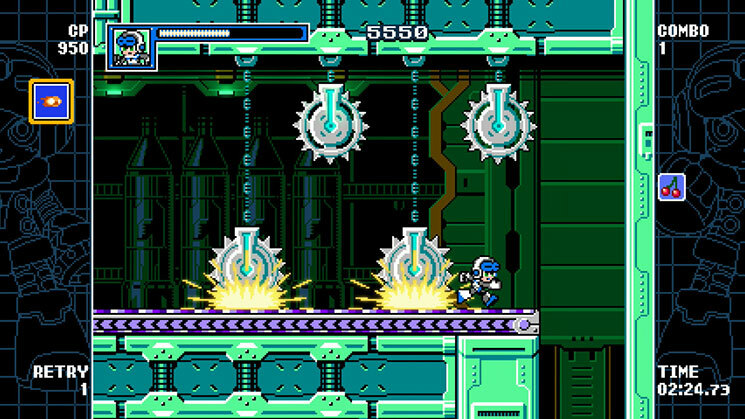 The levels themselves are well-designed and interesting to work your way through; while “exploration” is relatively minimal in most cases — this is a game that pays homage to Mega Man, not Metroid — there are plenty of secret areas to discover, with an optional “Dowsing” ability helping you to track them down via tactile feedback on the Switch version. Each area has a pleasingly distinct “feel” to it, with some focusing on the platforming aspect of the game, while others demand careful timing or accurate shooting skills. The bosses, as you might expect from a game of this type, are a particular highlight of the experience. Rather than simply adopting the same attack patterns as their Mighty No. 9 counterparts, here your foes present you with encounters that are recognisably similar to those in Beck’s original adventure, but with enough differences to keep you on your toes. Randomised elements are kept to a minimum in these confrontations; rather, victory is dependent on you being able to recognise the clear patterns and audio-visual signals of what to expect. The boss sprites feature clear, distinct animations that, once learned, can be used to accurately predict what is about to happen and deal with it accordingly, whether that’s getting out of the way of a particular type of attack, or taking advantage of an opening. And while you don’t unlock specific new abilities or forms from defeating particular bosses, the elemental affinities you can apply to your shots once you’ve unlocked them correspond to the bosses’ weaknesses from Mighty No. 9, allowing you to bring each encounter to a close a bit more quickly by switching your shots to the appropriate type. 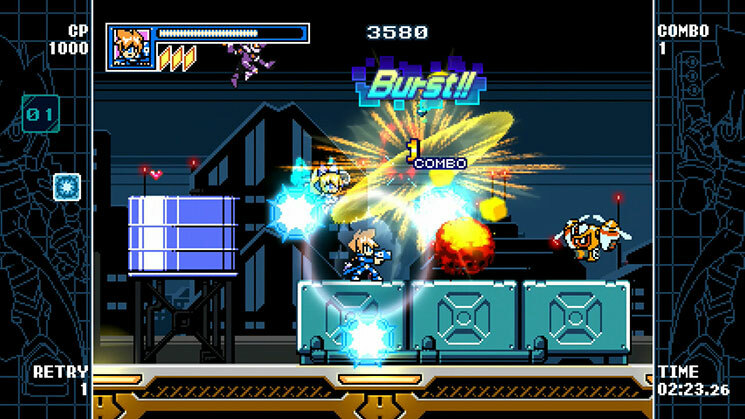 Like many of Inti Creates’ other games, Mighty Gunvolt Burst is a game that initially appears to be very simple, but continued play reveals it to have plenty of hidden depth, not just from the extensive customisation system, but from the additional material that encourages you to keep on playing even after you’ve “beaten” it. Beyond clearing the game and getting 100% completion with each of the characters, there’s also a “Challenge” system that tasks you with completing various goals and rewards you with pixelated “stickers” for doing so; these can then subsequently be used either for your character icon in the upper-left of the screen, or as custom markers for different loadouts of your characters’ abilities. These stickers primarily focus on characters from across all of Inti Creates’ games, and even include some characters that don’t directly appear in Mighty Gunvolt Burst itself — Shinobu and Maya from Gal*Gun Double Peace are among the collection, for example — as well as different expressions for many of the playable characters. Ultimately, Mighty Gunvolt Burst is what you make of it — though even if you just romp through the game once and never explore any of its extended content or additional characters, it’s still a great time. It represents Inti Creates letting loose and just having fun with game design rather than taking itself too seriously, and it’s all the better for this. While I certainly have a lot of time for the company’s games that play themselves more “straight”, such as Blaster Master Zero and Azure Striker Gunvolt, I really hope this isn’t the last game of this type we see from Inti. 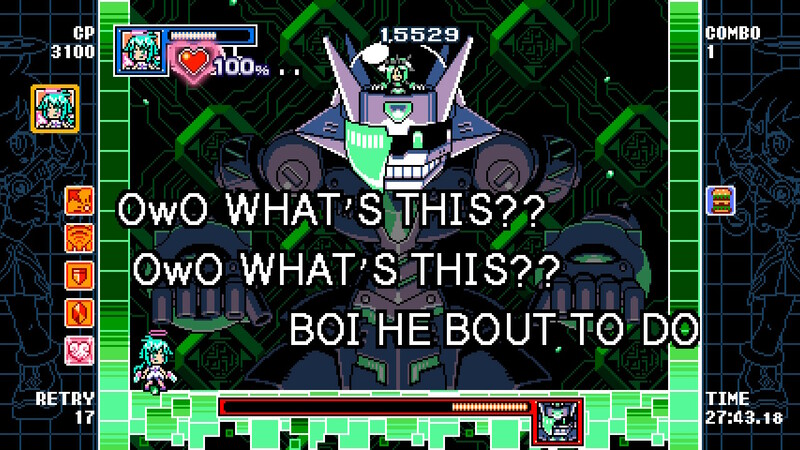 It’s obvious everyone involved in making Mighty Gunvolt Burst had an absolute blast doing so — and that, in turn, makes it very hard not to feel your own profound sense of joy while playing it. Tried the free demo of this, got confused, punched a wall, and that was the end of that. Then I got Owlboy. It’s a HOOT! I see what you did there. It’s clever, because owls hoot. They also dismember other animals, but I decided to not go into gruesome detail. The onomatopoeia for that is harder to express, too. I imagine there’s a Japanese onomatopoeia to represent it, though, that language seems to have them for the strangest things. Yeah, it’s those noises Link makes when he rolls.